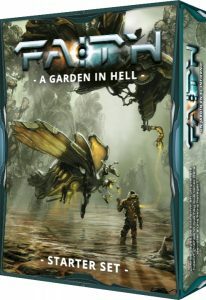 A Garden in Hell is a boxed starter set for the sci-fi FAITH Role-playing Game, written by J.C. Alvarez and published by Burning Games. DISCLAIMER: Roleplayers Chronicle was sent a copy of the boxed starter set for review. FAITH is a new sci-fi tabletop role-playing game with a variety of influences. It’s part cyber (not really cyberpunk, but cyber-sci-fi), dystopian future, gothic sci-fi, and space exploration. I’m not really sure how to best categorize it, but that’s a pretty common feature when it comes to sci-fi. 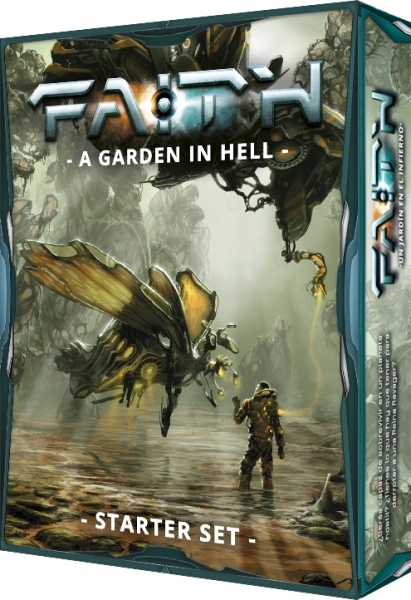 It is a Kickstarter-backed project with a long list of contributors and launches in a nicely-packaged boxed started set called A Garden in Hell. The boxed start set comes with an abridged version of the rulebook and a lengthy adventure/campaign with some supporting accessories. The accessories include pregenerated character handouts, weapon cards, NPC cards and some cards with the major NPCs on them. It’s quite the packaged deal and yet comes with an affordable price tag. FAITH also describes itself as a storytelling game, but it’s really more like a traditional RPG than it is like a traditional storytelling game. The biggest reasons being the amount of mechanics to support characters, the level of detail relating to combat, and the traditional player/GM design. The only real storytelling mechanism is the fact that characters always succeed every action by default. The only time they have to worry about difficulty is if someone is opposing the action. FAITH is a unique system that uses playing cards in lieu of dice. I believe the cards are simply played from your hands, but the mechanics aren’t fully described nor is an example provided (more on that later). 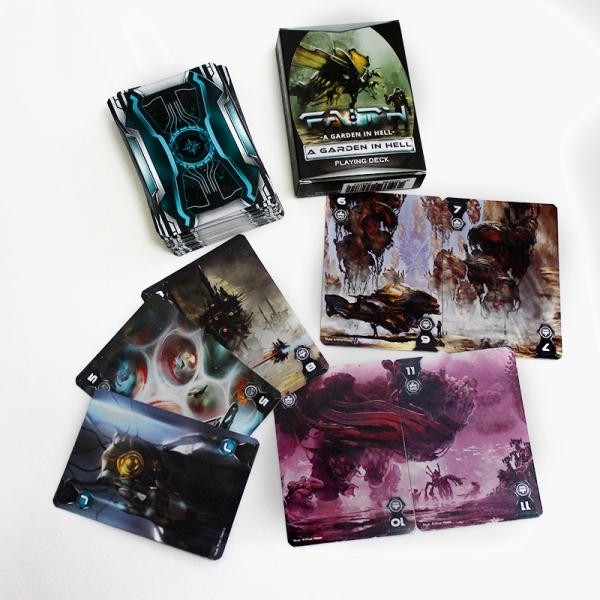 The box set includes a custom playing card deck designed to match the artwork of the system, which is ultimately it’s biggest selling point (the artwork and the setting that goes along with the artwork that is). Although the use of cards is unique, it’s nothing that wouldn’t be easy to pick-up and shouldn’t really sway one’s opinion one way or another (unless you really, really like or dislike dice that is). I will say that it’s a nice change of pace and keeps the game original. After reading through the starter set rulebook from beginning to end, you can tell the bulk of the funding for this book went into its artwork and production value. The entire boxed set looks AMAZING from beginning to end with an incredibly professional look. The editing, however, is horrible. I’m not referring to proof editing where there’s lots of typos and grammatical errors, I’m referring to editing the design, formatting, and content layout of the book (not graphic design layout, but the flow of the content). The sections that explain the mechanics feel disconnected and out of order. Almost like each paragraph was cherry-picked from a larger core rulebook in the hopes of stripping out enough to fit within a certain page count. Many of the game’s mechanics are either poorly explained, located in obscure locations, or not explained at all. For instance, I found multiple occasions where the number of cards in your hands defines the character’s stamina (effectively), but no mention of any mechanic to describe this. There are also some important character creation elements left out even though the book states you can create your own characters or use the included pregens… I say stick to the included pregens as you’ll never be able to create your own characters without using content from the pregens anyway. The setting is also incredibly vague. You get a very brief introduction to the setting, and that’s about it. The funny thing is, the artwork is so intertwined with the setting that you don’t really know what the artwork is or what the setting really is. The GM would have an easier time though as the campaign book explains a bit more, but players will be lacking in understanding. In terms of game mechanics and their accompanying descriptions, the overall balance is quite poor. For a starter set, skills are over-explained, combat is well-explained, the actual game mechanics involving the cards is not explained enough, certain aspects of character creation are either not explained enough or not explained at all (such as Upgrades, Affinity, Species, and Professions), and the flow of the content is incredibly confusing. I actually read through the mechanics twice and referred back to a few sections a third time in order to resolve my confusion and I still ended up not knowing exactly how the game’s mechanics work. FAITH is definitely a game with potential. If I can find a way to better wrap myself around the card mechanics, I would love to give them a try. I honestly do not fully understand them from the A Garden in Hell boxed starter set, but I’m sure the upcoming core rulebook will provide answers to all the questions I have. The setting looks incredibly interesting and easy to expand upon, especially since it’s one of the first that I’ve seen that doesn’t center on humans, but instead centers on an alien race. The setting feels quite dystopian and gothic to me, which is my preferred sci-fi subgenres (that and sci-fi horror). I’m not 100% sure what the technology is truly going to look like, but then again this is a starter set and is meant to be a glimpse of the setting, not the full experience. The accompanying campaign gives a much deeper look, but only for the GM’s eyes! The production value of A Garden in Hell is amazing, but then I would expect that for a company that utilizes Kickstarter and hires graphic designers and a full production team (you should see how many people are in the credits!). I am very excited to see the full core rulebook in the hopes of seeing the full explanation of the game’s mechanics, learning more about the setting, and seeing what types of characters are meant for the game. My complaints here are only related to the assemblage of the starter set’s mechanics, not the mechanics themselves. I think the mechanics themselves are quite interesting, well-designed, and will make for some great gameplay.